Scythe is a name synonymous with aftermarket cooling hardware. I would like to wager that there aren't too many PC enthusiasts who hadn't at least seen, owned or heard about this well known Japanese based company's products. But who are Scythe, and what do they do? Scythe Co., Ltd. (Registered & incorporated in Tokyo Japan) originally started in Akihabara Electric Town located in Tokyo Japan, where visitors can find the latest electric products from computer parts and accessories to the world’s most advanced cellular phones with video camera capabilities, small displays and the ability to play movies! Scythe has had an impressive run of success with their range of innovative and well-performing CPU heat sinks; plus they've gathered a considerable fan base along the way. From the Scythe Ninja through to the Scythe Mugen, there is a Scythe heat sink for every possible scenario and end-user. 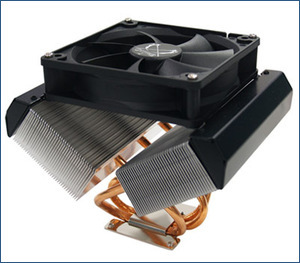 Today, I have been given the opportunity to review the Scythe Kama Cross CPU Cooler, which boasts an X-structure shape to allow the airflow to both cool the CPU, as well as components around the motherboard with a minimum loss in airflow. The Scythe Kama Cross has been marketed as 'Quad-core ready'; which will certainly be an area that I will be assessing when we arrive at that section of the review. Let's begin this performance review by looking at the Scythe Kama Cross's specifications. The specifications were unashamedly taken from Scythe's product page. The universal compatibility that the Scythe Kama Cross affords from socket 478 though to AMD's socket AM2 is a welcome feature; ensuring that those on older sockets can benefit from a quiet and efficient cooling solution. So too is the reduction in weight. It seems that many cooling hardware manufacturers are bordering on the 'crazy' side when it comes to size. If the Scythe Kama Cross can cool a quad-core processor efficiently whilst weighing in at just a smidge over 1/2 kilogram then I'm impressed. Meh, it seems like a decent mid-range cooler. Would be good for the HTPC or just a family build, not really the OCing side. In a PC mag review this cooler caused the PC to run hotter than the stock cooler. Which PC mag was that? Thanks guys it is a very capable little cooler.